It is perhaps appropriate to start the history of our village way back in the Bronze Age, about 1400 years before Christ. We are fairly sure that there was no village at Uplowman because the people of that time made their camps and settlements invariably on the higher ground, and even their paths and tracks tended to follow the line of the hilltops rather than the valleys. They had good reason for this, for the valleys were for the most part swampy and heavily overgrown with trees and scrub in which bears and wolves had their lairs, so any attempt to penetrate the low lying ground must have been both difficult and dangerous. A Neolithic (New Stone Age 4000~2000 BC) burial mound or long barrow has been found near Craze Lowman and axe handles also. Unfortunately the mound was levelled for cultivation in the 1980’s before it could be scheduled in 1990. About 60 years after the birth of Christ, the Romans, completing their occupation of the country, extended the great Fosse Way in to Devon and, caring nothing for swamps, forests and wolves, opened up the terrain, but in the main the Celts remained on the hilltops. A roman fort was discovered in 1978, during excavations for the Link Road, at Bolham which is just north of Tiverton and less than 5 miles away. Some 400 years later, they left the country and the Celtic inhabitants still disorganised and accustomed to being ruled by the Romans could put little effective opposition to our next invaders, the fierce and formidable Saxons. The Saxons, like the Romans, were not afraid of hard work or wolves, and started to develop the richer, low-lying ground. Their occupation of East Devon was completed about the year 670 AD and at some time between this date and the Norman Conquest, some Saxon looking for a likely site to settle must have come across the Uplowman valley and built himself a hut, and started to drain and clear the land. Shortly no doubt his friends joined him, and so our village was formed. 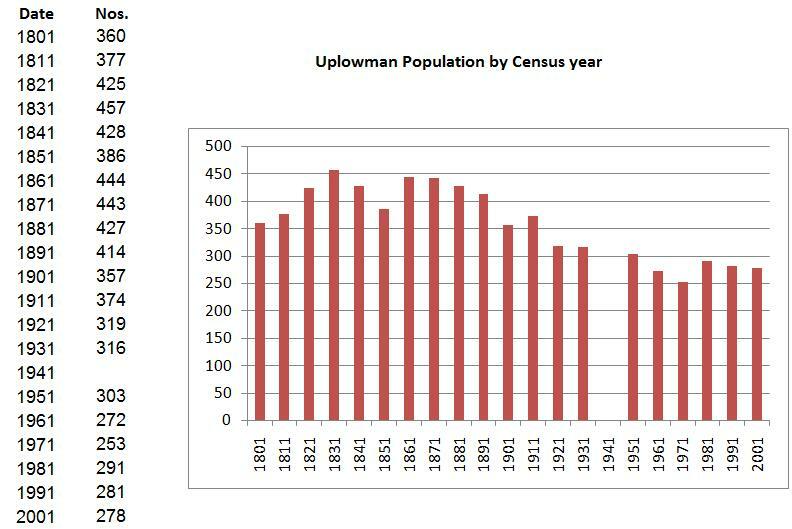 We shall never know why the village is called Uplowman, but the most probable theory advanced is that it comes from the Saxon word “lowmene” meaning slow-moving river. “Up” is obviously the upper part of the river, and “Craze Lowman” means the middle part of the Lowman. Prior to the Normans the land at Uplowman was a part of the Land of Gotshelm (which also included Ash Thomas, East Manley and Whitnage) and held in part by Alnoth who paid taxes, and by Aelmer, a priest, and after him Potoeline. The next invasion, and the last in terms of conquest, was by the Normans in 1066 following the Battle of Hastings. The Normans divided the land between their supporters and the first to hold the title of The Manor of Uplowman was the “de Lomen” or “de Lumine” family, who held it for three generations before passing to the Wellingtons during King Edward 1’s time (1239-1307). Later in the 15th century it passed to the Willington family, and then Beaumont and Powlett families. There is some question around the initial family as “de Lomen” means “of the village or area of Lowmen” and was probably the name taken at that time. It is mentioned that the Lowman family was the owner of considerable lands with the principal estate at Uplowman, on the banks of the River Loman. However, it is recorded in the Doomsday Book of 1086 that a Walter Claville, who does not appear in the rolls of the Battle of Hastings, that following the battle, he seems to have acquired holdings as an under-tenant in Suffolk under Roberet Mallet, and holdings in Devon. His home domain in Normandy was at Claville de Caux in the Seine-Inf near Rouen. It is feasible that he managed the land as a tenant, albeit a rather senior one. The areas covered by Walter Claville ranged from Appledore, Ayshford, Witthycombe, Burlescombe, Craze Loman, Instow Coombe and Uplowman. The ownership of the land may have change through the centuries but to the vast majority of the people their lives continued working on the land. As with the remainder of England, so the area around Uplowman was farming land. Farming was the still main way of life and the associated employment. There was a gazette published called White’s Devonshire Directory of 1850 which described Uplowman and the main people in the village. It said that there were 428 inhabitants, of which 80 were in the Whitnage “tithing”. There was a school (see later) for poor children that was supported by subscription. It then lists the main people of note with their occupations. It will be noted that there were several farmers. The list below gives an insight in to life in the middle of the 19th century. Brice, Thomas Whitnage Holloway & son. Notice that John Redwood was not only a “vinctlar” or inn keeper but a wheelright. Some of the above names are still familiar today as their families still live in, or near, Uplowman. The population had peaked in 1831 to 457 and had fallen by 1911 to 374. The Great War caused the numbers to fall significantly so that there was only 319 by 1921. The 20th century saw some of the biggest changes in the makeup of the population. The area still retained its rural character but there was a major shift from the land and the occupations that support farming. This was part to do with improved transport, part with more employment opportunities elsewhere in the towns, but also to the mechanisation of farming requiring less farm labourers. Where once the horse was the main tool now the tractor was to become supreme. There were still blacksmiths around until well after the second world war but by the late 1950s life had changed. It is difficult to believe that the blacksmiths that sat at the opposite side of the crossroads was not demolished until the 1960’s. And with the change in employment so too came the need for more housing. A number of new houses were built immediately after the war at Crossways, and indeed some of the present occupants were the first tenants. In the 1970’s and on into the 1980’s there were a large number of new houses built but with the establishment of planning regulations the numbers after were severely restricted. It was in 1965 that the Tiverton link road was built, which while not directly affecting the village did change a few Parish Boundaries such that Broadview Farm moved from Sampford Peverall to Uplowman, and Neddicotes to Halberton. The building of the road did have some side benefits in that the road to Tiverton was widened in several places for diverted traffic. It is perhaps hard to imagine that it was as difficult to get to Tiverton in the same way as it is now to Whitnage. There have been new houses built where there was Crosses farm, School House has been substantially rebuilt and Glebe Cottage demolished and rebuilt. Perhaps the biggest change has been the opening of the Village Hall in December 2002. Over time there have been numerous changes but the village still retains the Church, the School, a public house and a Post Office which is more than many small communities in Devon, or elsewhere. It is difficult to foresee the next 50 years but the past shows us that there will be changes and that we need to adapt.